Gauge. I am not fond of that word; however as a knitter, it must be used. On occasion, at least. If you have followed me for a while, you may know that I tend to knit things where gauge is not quite so important. Not only am I impatient and like to get started on my project right away, but I am rather mathematically challenged. Calculating is not my strong point, therefore by choosing to knit scarves, dish cloths, etc. I don't have to worry about spending many hours knitting something that may not fit even after carefully calculating my stitches. If you are a math whiz, then this will be a simple process for you. If you are knitting a sweater, hat, socks, or anything else that needs to fit - then gauge is a very important step that should not be skipped. If, however, you are knitting a dish cloth - why bother with gauge? After all, gauge is just a square, and so is a dish cloth. I think that is a waste of time, but I often see "To save time, be sure to check gauge" noted on many dish cloth patterns. If you are a stickler for getting the exact same sized dish cloth as the pattern, then by all means, swatch away! Gauge is typically measured over 4 inches of stockinette or garter stitch, although you will at times have a pattern call for the gauge to be taken over the stitch pattern used on the garment. Since you are measuring 4 inches, your swatch should be larger than a 4x4 square - 6x6 is the minimum size I would recommend for swatching. You should always treat your swatch as you plan to treat your finished item; for instance, if you are using a yarn that is machine washable and dryable, then you should wash and dry your swatch before checking the gauge. If you are using wool or other natural fiber that you plan to wet block, then your swatch should also be wet blocked prior to taking measurements. Now, once your swatch is ready to go, get out your ruler. Be sure the swatch is laying flat, and you are not stretching or pulling it in any way. Choose a spot around the middle of the swatch to lay your ruler. Place some type of marker at the edge of the ruler (you can use a DPN, split ring marker, safety pin, etc.) and then another at the 4 inch line. Count the stitches between your markers, and then divide by 4. This number gives you your stitches per inch. (See the pictures below) Half stitches should also be included - do NOT round up or down to make it easier on your brain, no matter how tempting. If you end up having more stitches than needed for your particular pattern, then swatch again using a larger needle; if you have too few stitches than needed, try using a smaller sized needle. Gauge in the round is done a little differently, because your tension tends to be a little different than when you knit flat. 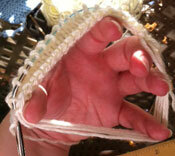 Your swatch should also be done in the round, or, use the trick in the video below to 'sort of' knit a round swatch. Basically, the idea is just like when knitting an I-Cord, except that you are leaving a lot of slack on the back side instead of pulling it tight - by doing this, it will allow you to lay the fabric flat to get an accurate measurement - do not turn the work, but slide the stitches to the other end of the needle and continue knitting. You always want to work on the front of the fabric, because that is what you do when knitting in the round. Here are a couple of pictures of a swatch in the round, but please do watch the end of the video as this is better demonstrated than in written word. Now, here are some pictures of both garter and stockinette fabrics and the SPI (stitches per inch) in each of these examples. Place your ruler at the beginning of the first whole stitch, and a marker at that stitch, and another at the 4 inch mark. Be sure you are measuring somewhere around the middle of your swatch, so that any sloppy edges aren't interfering with your stitch count. Count the top row of bumps between the markers as shown here; then take that number and divide by 4. That is how many stitches per inch. In this example, I have 14 stitches over 4 inches, which is 3.5 stitches per inch. 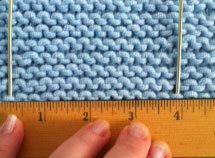 Just as with garter stitch, place your ruler somewhere in the middle of your swatch, at the beginning of a whole stitch. Place your marker at this stich, and another at the stitch at the 4 inch point. I have 18 stitches, divided by 4 is 4.5 stitches per inch. For stockinette, you want to count the 'V's. These are your stitches. 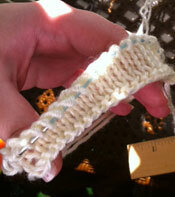 I find counting stockinette stitches harder than garter stitches - my eyes tend to go a little buggy. In this photo, I have highlighted the stitches to make it easier to identify. You can see here, I have 4 whole stitches, (highlighted in pink) plus half a stitch (highlighted in yellow) in an inch. Below also is a video on gauge, in garter, stockinette, and in the round. There are articles a-plenty around the web. I've also included some links for further reading. Happy Knitting!